People. Passion. Growth. Generosity. Fun. 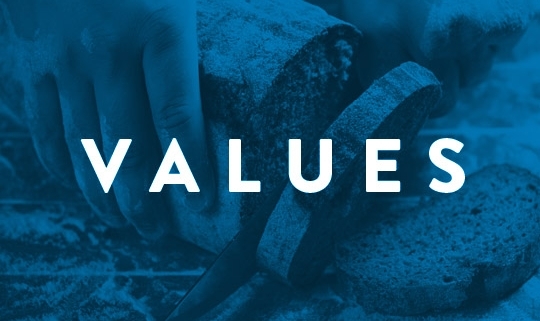 Values are the foundational framework that everything hangs from in any organisation, regardless of its size of influence. These values set the tone of how you go about everything, from the smallest to largest task. Our values are therefore at the very heart of what we do. They are the ‘way we do’ the ‘what we do’ because of the ‘why we do it’. The ‘why’ is simply found in Jesus. People – Jesus was all about connecting with people. Sometimes the people He built friendships with, or those He spent time with, were not at all who you would expect Him to. His friends included prostitutes, tax collectors and working class men. The Church of Christ has always been about people. The Church is a people, not a place! Passion – Passion is the fuel that feeds the fire that burns. Passion is not just a romantic gesture; it is gutsy, determined and faithful. Passion needs a purpose and a place to be free. Passion is committed and a way in which you can fully give of who you are. Growth – The first sign of death is when something stops growing and as cells cease to multiply. Growth and learning are lifelong processes. Change is at the heart of Jesus’ message. Growth is God’s desire for the individual as well as the gathered Church. This then spills out into society. As the Bible puts it so well, we are “one body with many parts”. Generosity – The Bible flips the world’s view on its head. “It is better to give than to receive”. We see time and time again God’s leading way, with His overflowing generosity to us, His children. Our desire is to show people the generosity of God through our lives and actions. Fun – We are a people of celebration of life and the desire to enjoy it. We want to live life to its fullest.